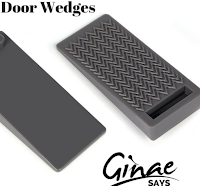 These door stoppers are comprised of durable PVC. They have a groove on the bottom and projections on the top so that you may stack them. This is just smart! They also have waves on the bottom to increase a good grip. At just a hair under $10.00, this seems fair for 4 of them. They seem a hair short and while I cannot find a problem with this, it just sticks out to me that they are so short. Perhaps, it is time to upgrade my thinking!